Description: Move in ready 4BR 2.5 BA 2009 Colonial in established neighborhood awaiting its new owners. Home features include Corner lot, Hardwood flooring, Granite Kitchen counters, Stainless Steel Appliances, 1st Floor laundry, attached 2 car garage and water softener system. Full basement ready to be finished for even more space. 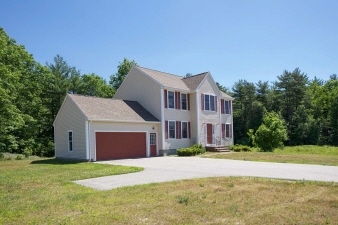 Country feel yet close to Rt 101 and shopping only 1/2 hour from NH beaches. 1 year Buyer's Home Warranty included. Property tax is estimated.